Research on the fragile states of matter that could give traction to the many promises of quantum computing has been given a boost by a comprehensive set of theoretical tools developed by A*STAR researchers. Long theorized but notoriously difficult to achieve in practice, quantum computers rely on a mechanism in quantum physics by which an object can simultaneously exist in a fuzzy superposition of multiple states. This and other complementary quantum processes could theoretically be utilized to perform complex operations many times faster than in classical computers. Yet despite significant research and investment, quantum computers are still undeveloped, with only a handful of rudimentary computing platforms demonstrated experimentally. One of the principal reasons for the lack of progress is the fragility of the quantum states that support mechanisms like superposition. Electrons and light, the typical 'information carriers' of quantum computing systems, both have quantum properties that could be exploited, but the trick is to create a physical material system that provides the interactions needed to make the quantum phenomena appear. This takes researchers into uncharted physics territory. Bo Yang and Ching Hua Lee from the A*STAR Institute of High Performance Computing, in collaboration with researchers from China and the UK, have now developed a general theoretical framework for a promising class of quantum material systems that will provide a universal language for researchers in this pioneering field. "Our framework describes a class of exotic phases of matter consisting of a very thin sheet of electrons subject to a strong perpendicular magnetic field," explains Yang. "Unlike conventional phases of matter such as liquids or solids, these phases are defined by specific patterns of electrons 'dancing' around each other." Different 'dancing patterns' produce different two-dimensional states, or 'topological order', in the same manner that pin pricks in a piece of paper produce different patterns. 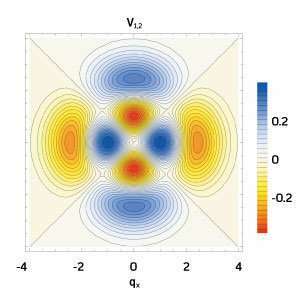 And while quantum mechanical properties are generally very fragile, those manifested through topological order are very robust and could theoretically be utilized for practical applications such as topological quantum computers. By analyzing the algebraic structures of various simple models and validating their results against large-scale numerical computations, Yang and his team developed a model that allows physicists to study these topological states over a wide range of conditions, including states that are common in real materials. "Our work can help both theorists and experimentalists to understand and realize highly interesting new phases of matter," says Yang.